I am running RPCS3 v0.0.5-7486-90f81659 Alpha. CPU: i5-3330 CPU @ 3GHz 4 threads. Whenever I attempt to install the Ps3UPDAT.PUP file (V. 4.83) the entire program crashes after reaching the 60% mark. 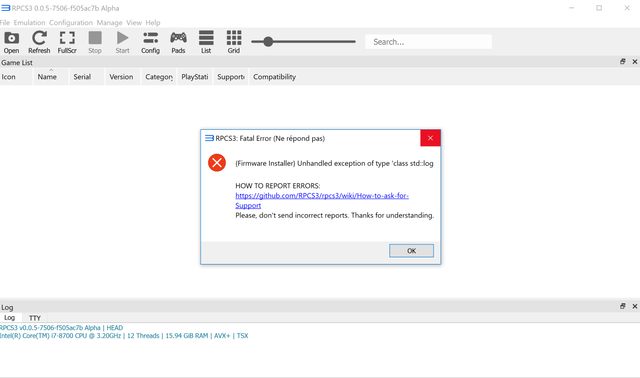 I've re-downloaded and reinstalled both RPCS3 and the firmware file probably around 10 times now, I've followed every official instruction I've been able to find (both the quickstart guide and these forums) and nothing has helped at all. I've checked, and my processor does have SSSE3 support, as well as AVX (according to wikipedia, my CPU is on their list) I just felt I should post here in case I've overlooked something; otherwise, I suppose I'll have to give up playing my favorite ps3 games again. Did you try deleting the dev_flash folder before installing? Are you using custom VFS paths? One thing that strikes me is that AmariahRoad and I have the same GPU. And the install crashes at the same 60% mark. I tried deleting the dev_flash, but it did not work. The config is default, nothing has been modified. [attachment=11395 Wrote: Ani pid='302212' dateline='1542913648']Did you try deleting the dev_flash folder before installing? I've tried both the 24/11 and 23/11 rpcs3 windows builds. I have also tried the 4.83 and 4.82 firmware EU and US versions. I get failure at 92%, I've attached a screenshot. I have deleted the dev_flash folder and have not many any changes to the VFS paths. I've also made sure the windows requirements have been installed. I'm not sure how to get further debugging info. I did see an error message the first time with some numbers but cannot reproduce it. That last one is a different one. Never seen it before. Should probably file an issue report on the RPCS3/rpcs3 GitHub issue tracker. Update : With the latest build (28/11/2018) downloaded, unzipped with 7zip, problem is solved. Thanks, that seemed to be the problem. I downloaded the file several times from the Sony site and always seems to stop at around 115MB. For reference on 7-Zip right click the checksum option is "CRC SHA". The -c makes sure to continue the download if it is disrupted which means you can download the whole file. Hope that helps anyone else with a similar issue.